Sen Monorom, Mondulkiri – On May 17, the Mondulkiri Provincial Department of Tourism (PDoT) in partnership with WWF launched its Mondulkiri Tourism Development Strategic Plan for 2014 – 2018 which aims to encourage sustainable development of the tourism sector that will benefit people throughout the Province and contribute significantly to the conservation, protection, and preservation of cultural property and natural resources, and cope with global climate change. The vision of the Provincial Tourism Development Strategic Plan is, by 2018, the number of tourists will be increased to 300,000 to support the livelihoods and the wellbeing of the people in the province. The vision will be achieved through considerate use of natural resources and local culture, establishment of small-scale ecotourism and vocational training provision for local communities, diversified tourism products and services, awareness-raising of quality tourism services, and enhanced tourism cooperation with all stakeholders. Under the financial support from WWF-Denmark and DANIDA, WWF-Cambodia has been able to support the Mondulkiri Provincial Department of Tourism in formulating the Strategic Tourism Plan that would effectively generate conservation-based partnership between communities, private sector, national and local government actors and interested parties for the protection of Mondulkiri Province and its biodiversity. Conservation is needed in order to establish and promote ecotourism products and services; therefore, it is crucial to balance economic development with conservation through implementation of this plan. With the Tourism Strategic Plan in place, local communities will be one of the main actors and beneficiary, and local livelihoods will be improved through increased income and job opportunities. They will also receive training and support to ensure that they will be able to deliver quality tourism services. The plan will also serve as a mechanism contributing to the conservation and preservation of the natural resources and culture of the local people, which are threatened by unsustainable extraction and exploitation of resources. 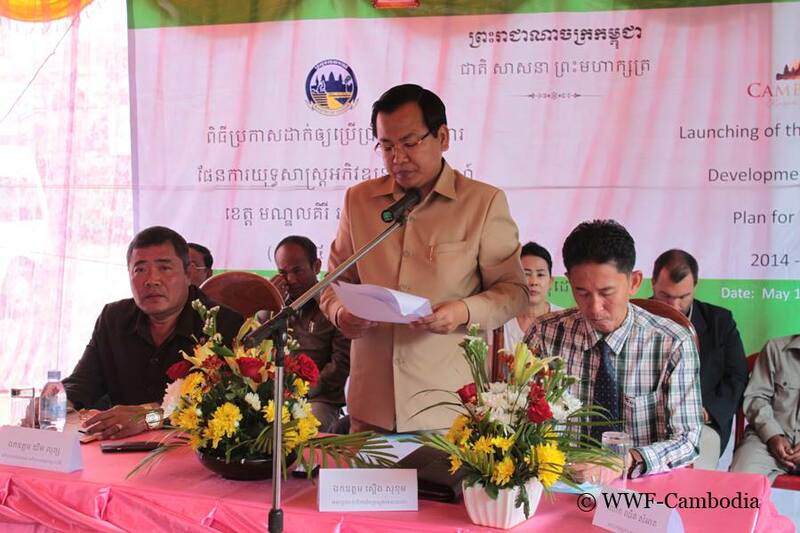 The aim of this plan is also to give long-term benefit to people and local economy by raising the importance of cultural, economic and environmental values of the landscape in Mondulkiri Province and its biodiversity. Sim Vantha, secretary general of Dei Ey lodge and leader of the ranger group, said that ecotourism services in his community has started in 2007, and since then, local livelihood has also been improved through increased job and income opportunities from providing homestay services, guiding tour, as well as from selling honey and traditional products. The launch took place at the same time with the opening of the Hefalump Café, which is supported by WWF, ELIE, WCS, and NOMAD. Hefalump Café was established as Mondulkiri’s responsible tourism hub where tourists can visit to get information of community ecotourism sites and tours in the Province. As part of the launching event, more than 120 bikers coming from across the country have participated in a professional mountain bike race and fun ride organized jointly by WWF and Flying Bikes under the theme “Bike for People, Culture and Nature” in order to raise awareness of the importance of nature-based tourism products that are available and need to be conserved in Mondulkiri Province. 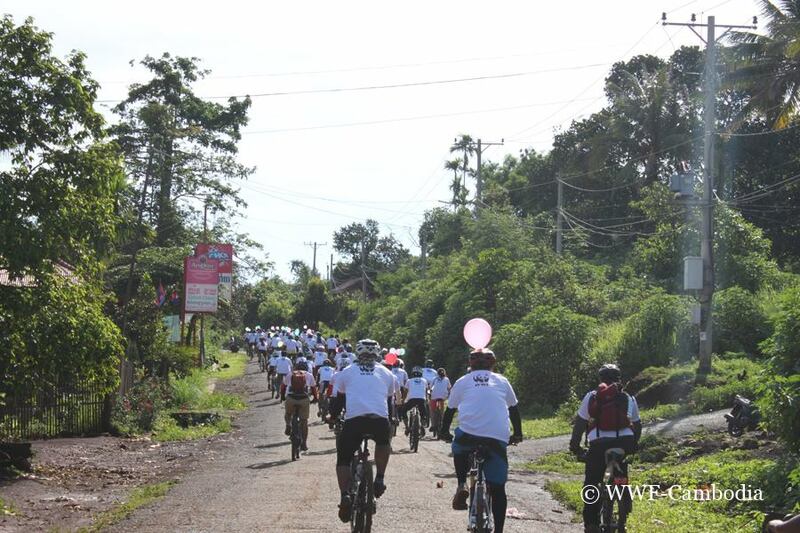 Bikers participated in a fun ride around Sen Monorom town of Mondulkiri Province as part of the launching ceremony.